Balancing body, mind and spirit with pure essential oils and herbs. Please refresh each page for the most current info. What is Aromatherapy and How do I Use It? Stop the ear itching and scratching and get rid of the foul smell !! Flutterbye Pooch customers have been successfully using the Pooch Ear Cleaner and Ear Remedy for over 20 years, many say they have not found anything to compare. This formula is anti-inflammatory, anti-fungal (x-yeast), antibacterial (x-infection), yet GENTLE! It contains organic apple cider vinegar for yeast, aloe vera for soothing the inner ear skin, and powerful essential oils provide the antibacterial and anti-inflammatory properties; and because it contains essential oils, this formula is not to be used on kitties. Any dog with long ears or floppy, hairy ears will be prone to ear problems due to the dark, warm, moist environment the floppy ears provide, this is a perfect breeding ground for yeast and bacteria. It helps to keep the ear hair pulled out. One of my customers wrote that her husband used the Pooch Ear Cleaner & the Black Walnut Tea Tree ointment to rid yeast from his toes! "Thanks for the update on when my order will ship. I already know my dogs love the products because we have used them in the past. I still have some Hot Spot Remedy oil (Sore Healer) which I am currently using for skin issues that have popped up since moving to a different state. We love the Ear Cleaner for maintenance & and the Ear Remedy is the absolute best! We no longer suffer with ear infections, what a relief. Thank you." This is a fantastic shampoo for normal bathing, but especially useful for dry, irritated skin that needs extra care. Handmade with a nurturing formula specifically designed to target the irritated skin that occurs from allergies, dirt, bushes, rose thorns, grass, weeds, field tags and other environmental irritants. This versatile soap is made with our standard luxurious vegetable oils which provide superb coat nourishment. The addition of NEEM provides extra pest control as well as amazing skin healing. This has quickly become one of our most requested products. You'll also find a milder version of this soap on the Baby page since we recommend it for treating one of the most irritating skin problems ever: diaper rash! with colloidal oatmeal, Vitamin E and essential oils that nurture the coat and also relieve itching and calm the skin. Organic colloidal oatmeal and organic hemp oil soothe the skin, tea tree essential oil provides an antiseptic blend especially good for staph infection or itchy rash. Blended with our extra emollient base oils for the Pooch shampoos and it's good for any skin problem that needs superior healing attention. Excellent to use when you want the properties of the essential oil, but need a gentler application. A gentle but effective and aromatic flea spray for both dogs and cats, as well as to help eliminate dander and keep their coats shiny and sweet smelling. The container for the 4 oz. size is a flip top bottle. This comforting powder is lovingly handmade for your Pooch. Ground herbs refresh and soothe the skin, and the pure essential oils are calming and repel fleas. Our powders are talc free. Now includes NEEM for additional pest repelling and skin nurturing! These pest prevention products are 100% All Natural and contain no chemical pesticides. They actually smell good since there is no citronella or pennyroyal in them. They're made with essential oils such as lemon tea tree, eucalyptus, patchouli, cedarwood and others ... all excellent for the coat and skin and highly effective at repelling ticks and fleas. Commercial products that contain pesticides will, of course, cover more than one type of bug -- mostly anything in sight! :( But with natural products, each one is specific for the type of bug it targets. In nature there are individual plants that have specific properties, and by combining the specific essential oils from individual plants, we can accomplish pest prevention through a natural method. So be patient when using natural products, and diligent in their use. 1. BLEND: Rub the blend into the dog's 'approach' points -- the chest, legs, neck, etc. This should be used 2 or 3 times a week. 2. SPRAY: Apply the Spray into the coat by lightly spraying the entire body; or part the hair, spray and brush. This can be used daily, just before you go outside. "I just wanted to let you know that I had to give in and use Advantage early in the summer. However, the fleas returned within a few weeks time. Then a friend of mine told me about your website and I'm the one that ordered both the flea products. Yea! I've just got to tell you that I'm so impressed! I'd never have believed that a natural product could keep the fleas away but my boys are proof! I love taking them out and now I don't have to worry, I'm doing the spray and the blend just as you directed on the bottles and its working!! :-) "
A nice citrus/mint/woodsy aroma that is effective, but is minus deet and the awful smell of citronella. Includes several of the over 19 essential oils that are insect repelling, including eucalyptus citriodora which contains a higher citronellal content than citronella, but has a woodsy, lemony aroma. All natural, nice smelling, repels mosquitoes, gnats, flies, etc. for hours. 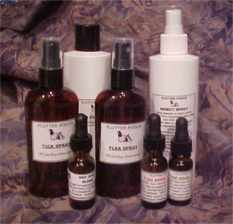 "I have to admit the pooch insect spray works great and I am talking about on ME. I mowed my mother's lawn, at dusk no less and skitters were swarming... I sprayed myself from head to toe. I mowed with only one pesky tiger skitter bite. I love this stuff and i smelled good too." Sore Healer has an amazing capability to calm skin and dry up weepy abrasions such as hot spots, allergy skin problems, dermatitis, and surgical wounds. Can be applied directly to the area with a cotton pad. Use the concentrate on small boo-boo areas, use the Liquid on large areas or whole body. the product efficacy have not been evaluated by the U.S. Food & Drug Administration. The products mentioned within are not intended to diagnose, treat, cure, or prevent any disease.